The flagship of the revolution of the white peonies: that's our image of In Full Sail. A firm peony that can not be compared to its rivals. Simply because of its white colour with a touch of pink. Besides, he is not fully double flowered, but half. Thick steals, even thicker buds and flowers that can reach a size up to 20 centimetres in the vase. In Full Sail is almost a lookalike of the white Coral Sunset. 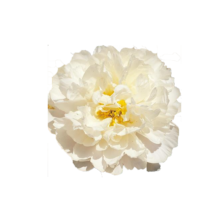 This peony offers you the same big, white flowers of the same maximum size. In Full Sail was created by Roy Klehm. The peony got registered at the American Peony Society in 1995. In Full Sail will be blooming for the first time in the midseason of 2020. We have a good number of them in stock so we can offer them on a big scale to our costumers. We predict a bright future for this peony. On his own in the vase, In Full Sail is outstanding because of its firmness. Do you prefer bouquets? Its delicate flower shape makes it a perfect flower for a bouquet.